Where Gene Rodenberry tapped a hitherto undiscovered 'human' side to science fiction, Steven Spielberg's attempt to do the same with submarine TV shows faired rather less well. It certainly didn't fail on production values, using pretty decent computed effects, some pretty impressive sets and, in all fairness, an excellent cast lead by Mr Jaws himself, Roy Scheider. Sadly, the underwater world isn't nearly as exciting as outer space when it comes to making thrilling television and despite promising to be something fantastic, turned into a bit of a turd, with only the occasional decent story to counteract all the duff ones. Of course, unlike the latest incarnations of Trek which have matured into generally excellent TV shows (even Voyager is pretty incredible these days with great stories and some superb acting and of course ever improving effects) SeaQuest didn't have the backup of being a long established entity and so despite some attempts to refloat it, including SeaQuest 2050 which featured the marvellous Michael Ironside in charge, it pretty much died the death. I suspect with a bit more imagination it could have been as good as promised, but of course the 90's TV audience won't accept giant squid for their action thrills and anything artificial just doesn't work, unlike space where anything goes. Oh well. After all that, the music. 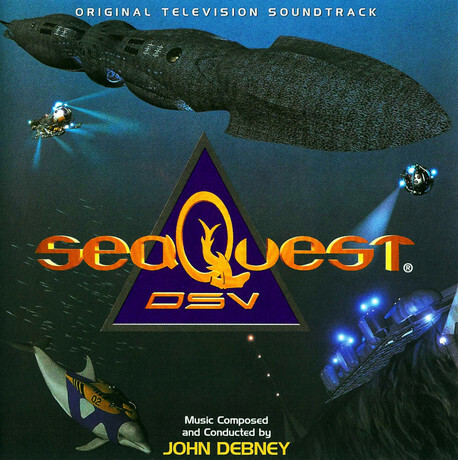 John Debney did, apparently, score a few episode of Star Trek: The Next Generation, probably when they were in their pre-dull phase and it is fortunate for us that someone noticed and gave him the chance to score SeaQuest. His main title is a whirling fanfare effort with synth (sadly) choir making seem all rather more riveting and exciting than it ultimately became. I would suggest that it was one of the strongest TV themes for an American sci-fi show (discounting Trek and Babylon 5). From this spawns Debney's score for the feature length premier episode score, which doesn't actually quote from the main theme much, per se, but does suggest it a great deal. Action sequences such as Preparing for Battle and First Engagement trundle along pretty entertainingly, even if they do occasionally suggest the odd piece of a James Horner or Jerry Goldsmith score. Dangerous Adversary curiously seems similar, in the harmonies at least, to Dennis McCarthy's Generations score, but the more beefy performance and recording do make it seem more exciting than it was in McCarthy's score. Sadly the two other scores which have even more brief selections are rather more verging on the tedious and are really quite disappointing in comparison. While they are perhaps not as derivative, the limitations of the TV time scale for composing start to show. Knight of Shadows makes virtually no impact whatsoever, even the portentously titled Waltz with the Dead is hugely anticlimactic. Such Great Patience is a fraction more interesting, even if the pseudo Abyss synth bits don't quite work as well as they might. The conclusion is at least a little more interesting and ends with a typical orchestral flourish. The End Credits is a short alternative version of the Main Title that nicely caps proceedings. While John Debney is a fairly technically accomplished composer and does at least have some of his own personality, this is hardly is his magnum opus. It does suggest his more interesting and diverse later works, especially the action sequences which were beefed up to mammouth scale in Cutthroat Island. However, the album running time is short and containing very brief selections from three different episodes, I think was a mistake. I can understand trying to get a little more diversity in style, but the feature length opener would, based on the selection here, have made a better album. If it had been an hour and a decent suite from each had been presented like the Young Indiana Jones scores, then fine, but obviously the huge expense of releasing large amounts of LA studio orchestra recording just couldn't have been done. 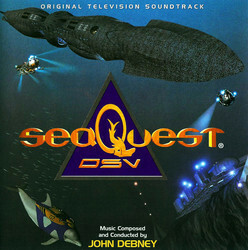 Still, worth picking up for cheap as it has its moments, but otherwise, skip to more recent, better John Debney scores.